A lazy Sunday afternoon seemed like the perfect time to break out my new Hamilton Beach 6 Speed Stand Mixer* and bake my very first homemade loaf of bread. Baking has never come as easy to me as cooking. To me cooking is more forgiving and artistic, whereas baking is more of a precise science. The other week I was watching a rerun of Ina Garten and low-and-behold she was baking up a storm per usual! Usually I can only dream about baking what she whips up, but this honey white bread recipe she was working on seemed like it would be an easy place to start. Ina always seems to have things perfectly together in her kitchen. She’s never frantically pouring extra flour while trying to make sure her mixer is set on the right speed and milk is at the right temperature to react correctly with the yeast. So this time I made sure to measure out all my ingredients ahead of time in separate little bowls. While this made for more dishes than usual, at least I knew I had everything in the right place. I’ve never had a stand mixer before and loved being spoiled by not having to get my hands gooey and being able to multitask in the kitchen. I was surprised at how much easier baking was with the mixer by my side and impressed with how well the dough hook stirred the mixture, even in the early stages. I only had to scrape the edge of the bowl once make sure the yeast was getting incorporated into the mixture. The hardest part of the whole recipe was ensuring the water and milk were at the correct temperature to react with the yeast. While I do my best for the most part to eat healthy, I am a sucker for butter and freshly baked bread with butter always sounds delicious to me. What is even better than butter you ask, well how about flavored butter! Epicurean Butter, created by Chef John Hubschman comes in 20 different flavors and they were kind enough to send me a variety of samples. If it were up to me, I would have tried all 15 flavors in one sitting, but Taste Tester #1 kept me in check. We tried Garlic and Herb on one slice and White Truffle on another. Then we moved on to the sweet flavors and tried Maple Syrup and Caramel Sea Salt. All four were absolutely amazing and I couldn't wait to think of other ideas in which to use them. I highly suggest the maple syrup on pancakes and white truffle for grilled cheese. 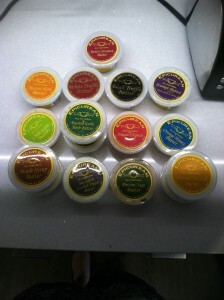 The different flavors were all pure grade AA butter with simple, high quality ingredients. They will definitely be a new addition to the condiment section of my fridge at home! Directions Place the water in the bowl of an electric mixer fitted with a dough hook attachment. If the bowl is cold, be sure the water temperature doesn't drop below 110 degrees F. Add the yeast and sugar; stir and allow them to dissolve for 5 minutes. Add the milk, butter, and honey. Mix on medium speed until blended. Add the egg yolks, 3 cups of the flour, and the salt. Mix on low speed for about 5 minutes. 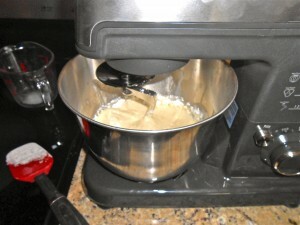 With the mixer still on low speed, add 2 more cups of flour. Raise the speed to medium and slowly add just enough of the remaining flour so the dough doesn't stick to the bowl. Add the flour slowly; you can always add more but you can't take it out. Knead on medium speed for about 8 minutes, adding flour as necessary. Dump the dough out onto a floured surface and knead by hand for a minute, until the dough is smooth and elastic. Grease a bowl with butter, put the dough in the bowl, then turn it over so the top is lightly buttered. Cover the bowl with a damp towel and allow it to rise for one hour, until doubled in volume. Grease two 9 x 5-inch loaf pans with butter. Divide the dough in half, roll each half into a loaf shape and place each in a prepared pan. Cover again with the damp towel, and allow to rise again for an hour, until doubled in volume. Meanwhile, preheat the oven to 350 degrees F. When the dough is ready, brush the tops with the egg white and bake the breads for 40 to 45 minutes, until they sound hollow when tapped. Turn them out of the pans and cool completely on a wire rack before slicing. 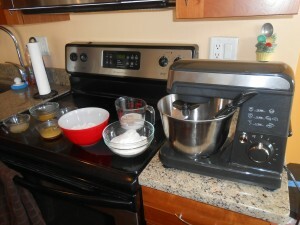 *Hamilton Beach was gracious enough to include me in their blogger ambassador program and send their 6 Speed Stand Mixer to try out complete with whisk, dough hook, and beater attachments.